Dragon ball GT - volumes 1 to 16 - the integral. Audio: French (dolby digital 2.0 mono). Region: Region 2 This DVD will probably not be able to be viewed outside Europe. More information on dvd formats & ## x2f; blu-ray. Form ratio: 1.33: 1. Release Date: November 2, 2016. Average Customer Review: 3.2 out of 5 stars 26 customer reviews. 215 in dvd & blu-ray> Japanese animation. N ° 968 in dvd & blu-ray> children, youth and family. N ° 1368 in dvd & blu-ray> tv series. Integral dragon ball gt (64 episodes) the story of dragon ball gt begins ten years after dragon ball z. Sangoten and trunks are 17 and 18 and pan at 14. Sangoku surprises pilaf, may and shou with the dragon balls in the palace of dende. At the moment when sheron appears, pilaf, surprised, thinks that he would like that sangoku be of size. The dragon takes this for a wish and hears it. Sangoku is left with a child's body but still retains its power. Mister Popo reveals to him that only the black dragon balls will be able to make him his size but these are dispersed in the space. Kaio says that if in a year he has not managed to reunite them, the earth will explode .. with our shop, forget about the stress of the deliveries out of time (see our evaluations). Our partners are committed to delivering your parcels as soon as possible, quickly, easily and efficiently! To all addresses other than apo / po boxes in France and Belgium. Our stock are in warehouses based in France. All orders are shipped via DHL, post, chronopost or ups (depending on location and package weight). Unless otherwise stated, all orders will be shipped within 48 hours of the date of your payment. Check our positive reviews to see the good reviews on the speed of our deliveries that we offer. To all addresses other than apo / po boxes in the lower 48 states, france and belgium. Our stock all ships from our france-based warehouses. If you are not delivered or the object does not match its description, they will refund you and help you find a solution with us subject to conditions. We offer a 30 day return policy for our products. We are behind our products. Items can be returned to us for exchange or full refund within 30 days from the date of receipt of your merchandise. We are not responsible for any purchase after this 30 day period. Return shipping costs are the responsibility of the buyer unless return is the result of our error. We do our best to treat as quickly as possible. We stand behind our products. We can not wait for it as soon as possible. 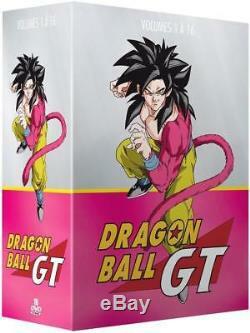 The item "dragon ball gt volumes 1 to 16 integral" is on sale since Wednesday, November 22, 2017. It is in the category "dvd, cinema \ dvd, blu-ray". The seller is "ddstores1" and is located at / en fr.